I’ll be honest here. 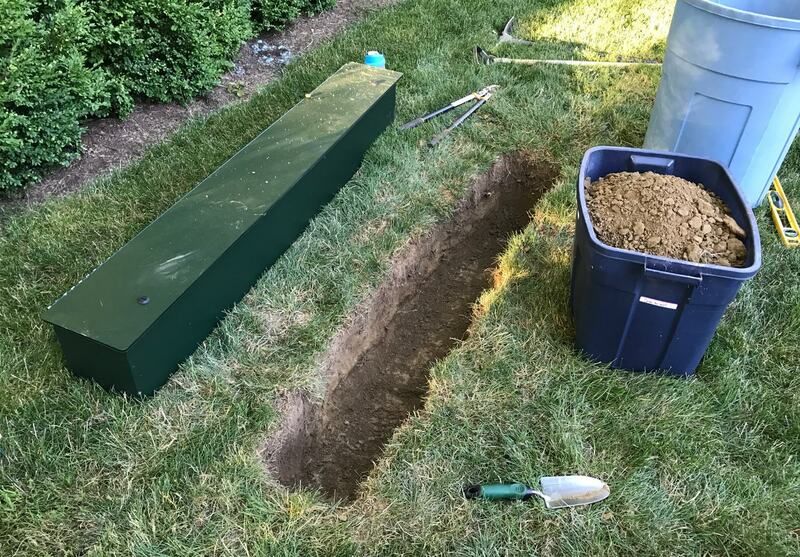 The thought of a 12″ deep hole didn’t sound all that daunting. And, I would come to learn, it’s really not that bad if you have the proper tools. I got down to about 7-9″ with just a shovel and a hand-held garden rake. That’s when the clay in our area slowed progress tremendously. 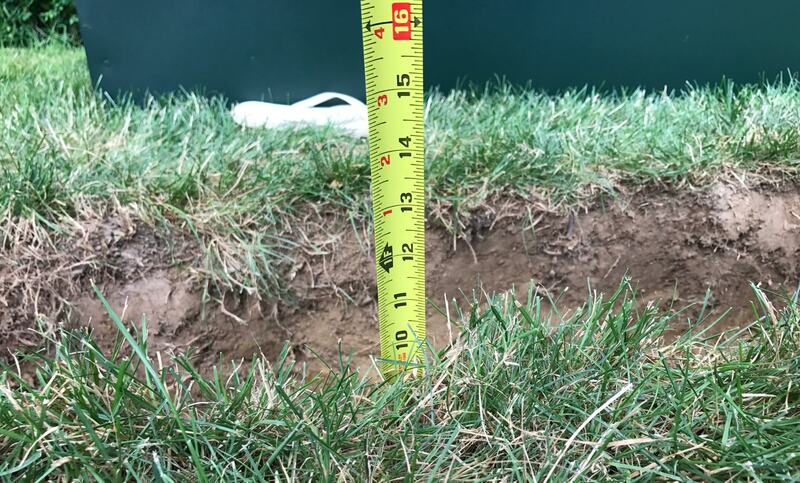 The first 80% of the hole took only about 30 minutes, but the last three to five inches were going to take hours. 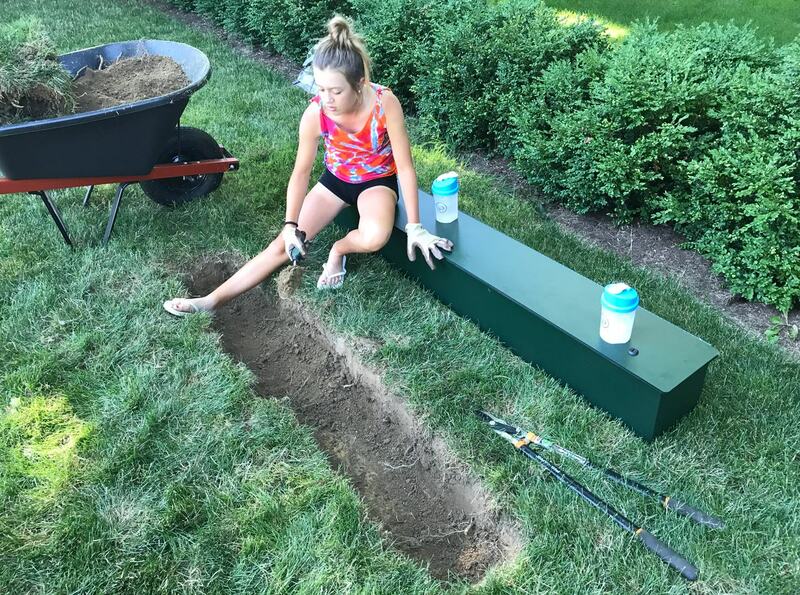 Step 1: Mark the edges of the CrocBox so you know where to dig. Until I got a mattock. A mattock is like a pick axe, but for scraping up and chunking away the clay-heavy soil we have here in northwestern Pennsylvania. With the mattock, the remaining three to five inches took about as long as the first seven to nine, and we completed the project in about 90 minutes, with another ten or twenty minutes of various length breaks to rest or call a friend (who had the mattock) to come over. 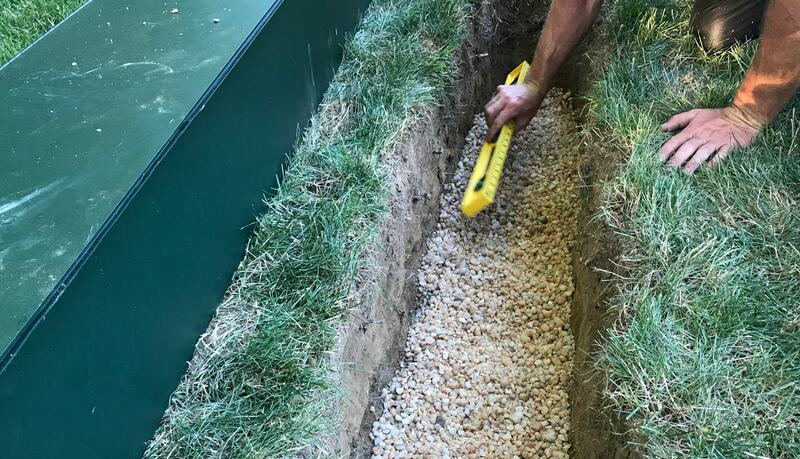 Gravel helps level the hole and provides better drainage. 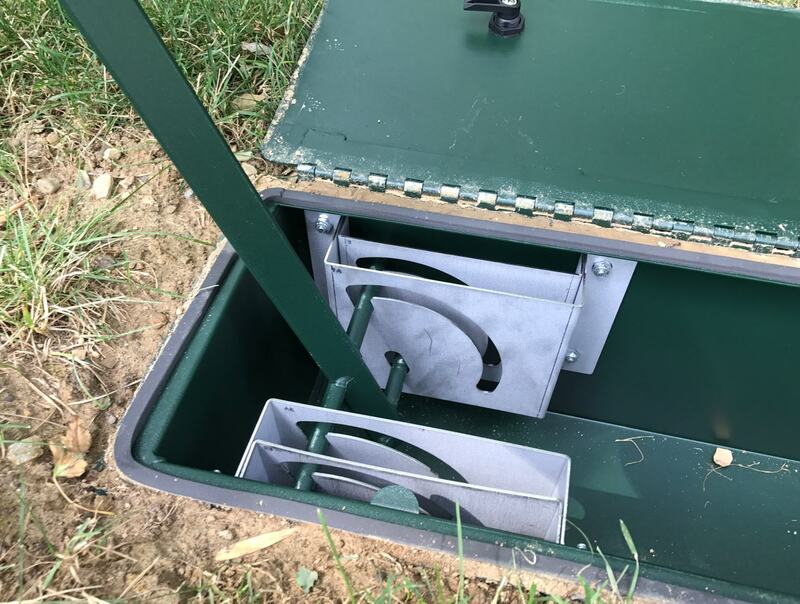 The CrocBox is fully installed and ready for use! The folks at CrocBox provide a really simple video (as seen above), as well as a PDF set of instructions for both installation and setup on their site. And, please… I don’t want to over-state the difficulty of installing the CrocBox. It’s not difficult at all… especially if you have the proper tools. If you’re not the do-it-yourself type, you could probably pay a local landscaper as little as $50 to do it for you. The CrocBox is heavy, but you’re not going to be lugging the thing around your yard. 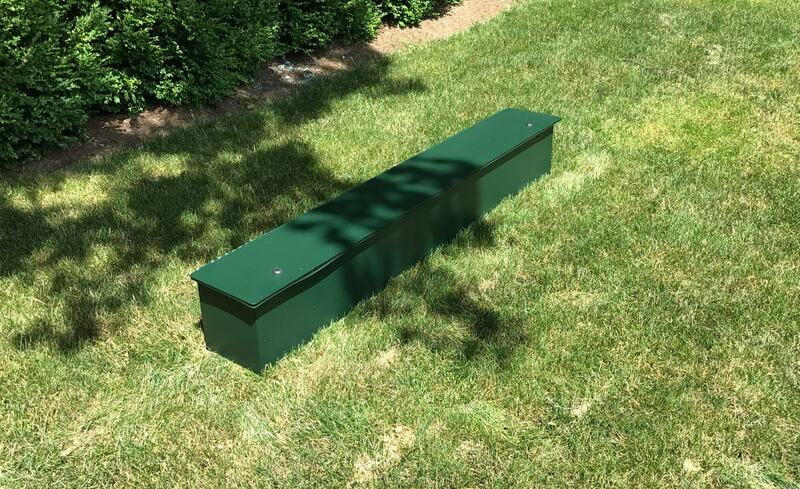 It’s designed to be installed in your yard and left there, year-round. Yes, year-round. Even in Erie, PA.
Metal in the ground – particularly in a part of the country where we get plenty of precipitation (in both liquid and solid form; rain, snow, and ice) – typically doesn’t fare very well. But CrocBoxes are made entirely from U.S. steel. The outside is powder coated to resist rust. The lid is described as “all but indestructible.” The interior hardware is galvanized stainless steel. 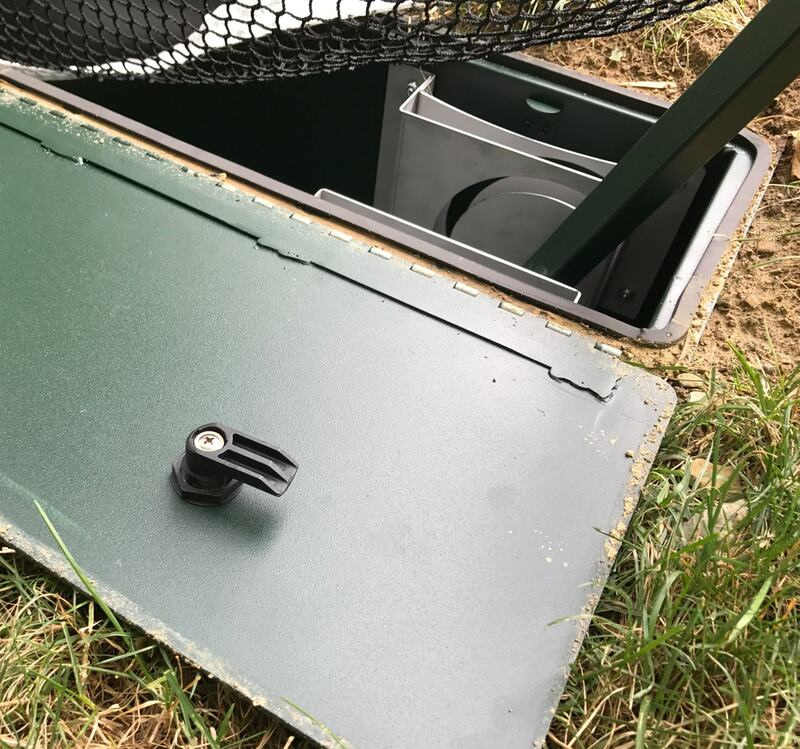 The makers say “with proper installation, your CrocBox will last for years of use.” As it’s flush to the ground, you can mow your yard without any interruption at all, even driving a riding mower right over the top. The box seals tightly with a foam membrane that keeps water out in a wide range of temperatures. The lid locks pull the lid tight against the foam liner to keep water out. As luck would have it, we didn’t get much rain for about four weeks after I installed the CrocBox, so I was unable to check how well the foam seal kept water out. As I noted above, the CrocBox weighs 75 to 80 pounds. It’s about 10″ x 9″ x 6′ in size, but unfurls to provide a net that’s 7′ tall and 10′ wide. The CrocBox after undergoing its first really good rainstorm. The CrocBox is advertised as taking 45 seconds to set up and 45 seconds to take down. In practice, these estimates are spot on. I use a quarter to open the two “locks” on the top and flop the lid over backward. I pull out left post, then the right. I extend each post until the pin clicks through the hole. I then push each pole out wider until each locks into their notch. In the time-lapse video above, my daughter (and I) set up and take down the CrocBox. She briefly struggled to get the pin to lock in to the pole (and I had to help push the pin in to collapse the pole during takedown), but this was done the first day the CrocBox was installed, and even then, with minimal instruction, she managed to set it up and hit a golf ball within 90 seconds. The CrocBox “hinge” is just a pair of metal guides two axles. I’ve encountered only two problems in setting up or taking down the CrocBox net, and both are very minor things. First, during setup, the metal rods or axles will sometimes bind, particularly if you twist the rod slightly so that both aren’t tracking equally through the guides. This just requires a little jiggle or a slight twist of the rod to re-align the axles in the guide (the silver pieces in the photo above). I’m sure that some plastic parts or something could have made this slide a bit more smoothly, but I wouldn’t be willing to sacrifice any durability, and plastic would surely be a loss there. Springs or some other form of locking/unlocking mechanism could possibly be used, too, but again I’d worry about the reliability and durability of such things. The pins on each of the two poles lock in place when fully extended. 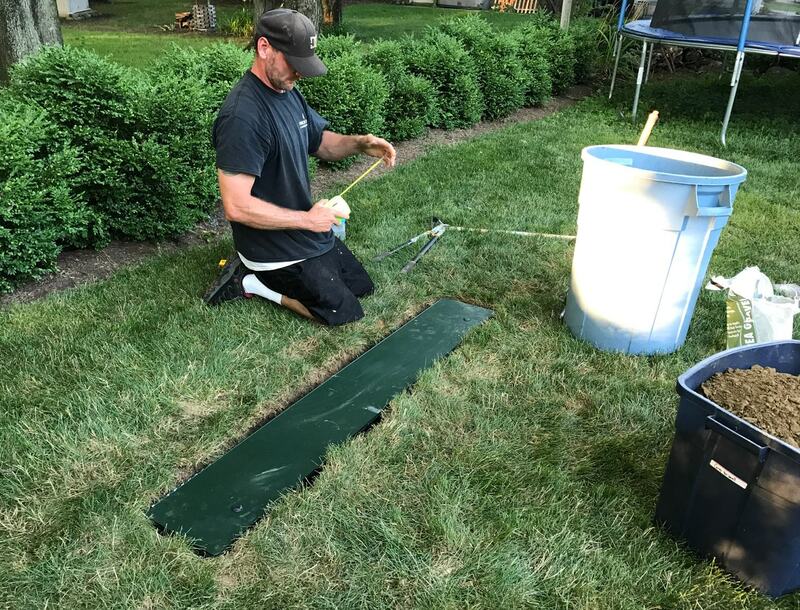 Second, during takedown, I’ve learned that it helps to slide the top half of the pole downward while holding onto the net, lest the net pool or puddle at the bottom right near the “hinge” area. 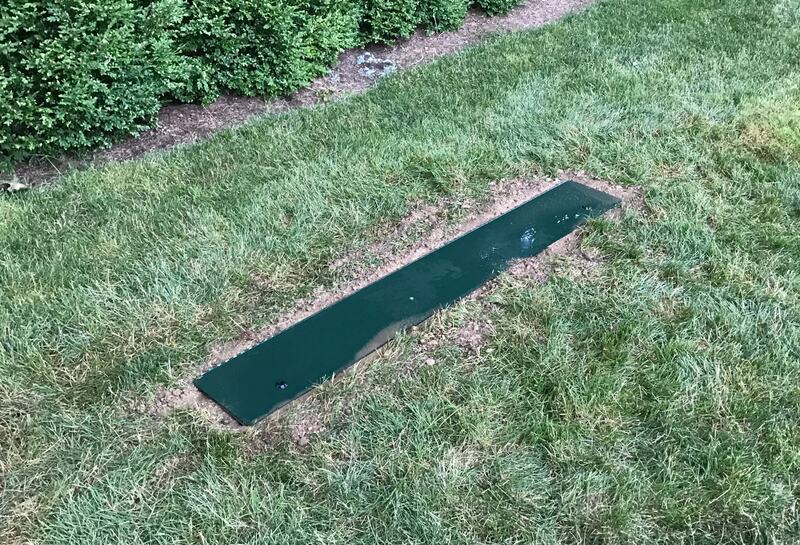 If you allow the net to puddle at the bottom, it can make putting the pole down into the box difficult. Again, this is easily worked around: just hold onto the net and keep it near the top of the pole as you slide it down after unlocking the pin. This is somewhat of an odd section to write, because at the end of the day… the CrocBox is a net. You set a ball down, you hit it, and the net stops it. …CrocBox’s patent pending design gives you the ability to use just one ball for practice. 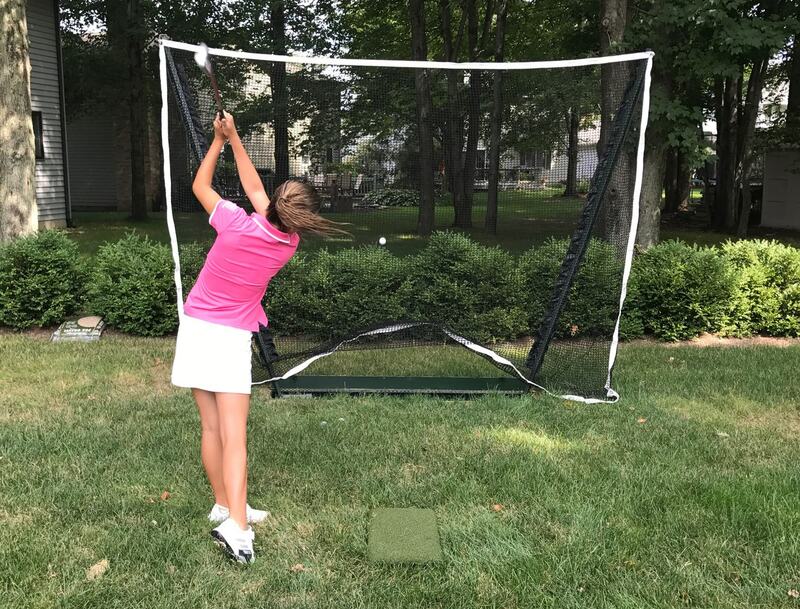 Our smart net will give you the expert shot feedback you need to improve your game. When hit properly, the ball will roll back to your club. When hit thin or heavy, the ball will not return to your club and stop short. When hitting the ball to the right, its return will be to the left of your club. When hitting the ball to the left, its return will be to the right of your club. Naturally, this depends on your specific setup. Christian Kelker of CrocBox told me that they carefully adjusted the tension and chose the proper net to allow this to happen. In practice, it works pretty well, though of course if the ball hits a thick clump of grass or something, it doesn’t work. The ball almost always returns close enough to you to reach out without coming out of your stance and pull it back to you. I’ve yet to have a ball do something like fall into the box or shoot away at a crazy angle. The net measures 7′ tall and is 10′ wide. This is wide and tall enough to catch just about every reasonable shot you could hit, so long as you’re within about eight feet of the net itself. 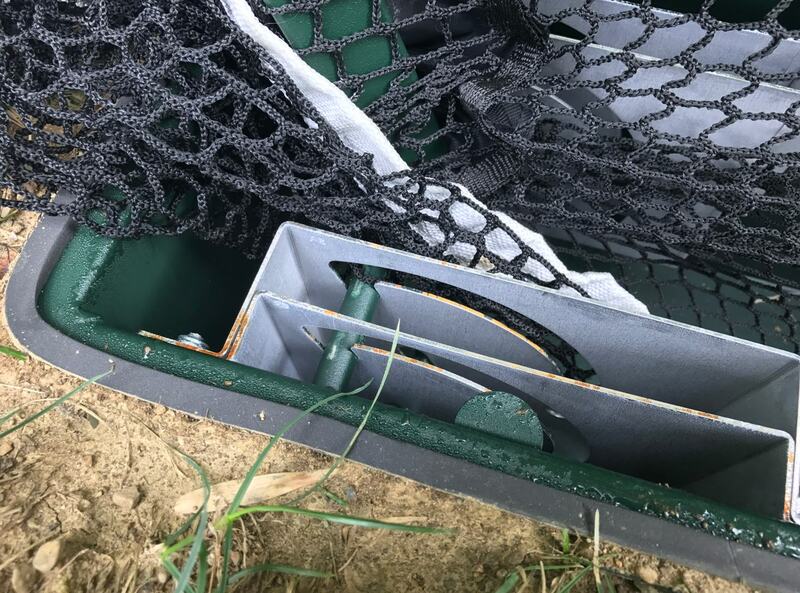 No, you can’t pop up a driver (it may fly over the net), and if you’re a shanker, you may want to devise a strategy for that, as the CrocBox net is not a “cage” style like you can find from other manufacturers, but you may also find, as we did, that all but the worst of shanks are still caught by the net unless you set up too far away. And those bad shanks, which we had fun trying to hit on purpose? They rolled pretty harmlessly into the bushes just behind the net. 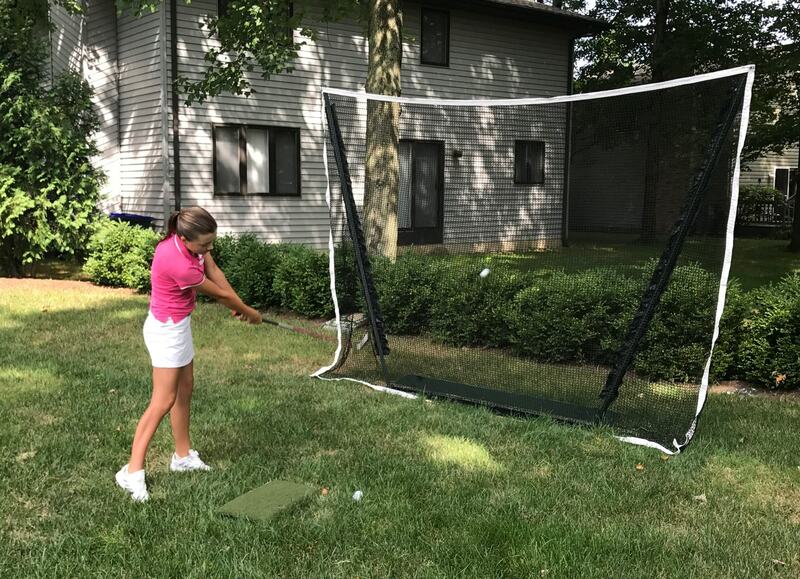 I have a fair amount of experience with netting with our indoor facility at Golf Evolution, and experience has taught me that two things are important when it comes to netting. First, the quality of the netting itself. Nylon twisted netting commonly sold as golf netting can be had in every quality level, and some will wear through and fray/rip after only a few hundred impacts in a small area. It’s not from the friction of the ball hitting the net, but often, the friction of the net rubbing on itself. The CrocBox spans a healthy 10′ and is 7′ tall, and fits in a tiny little box! At our indoor facility, we initially purchased some “golf netting,” but had to cover it with archery netting after about a year. 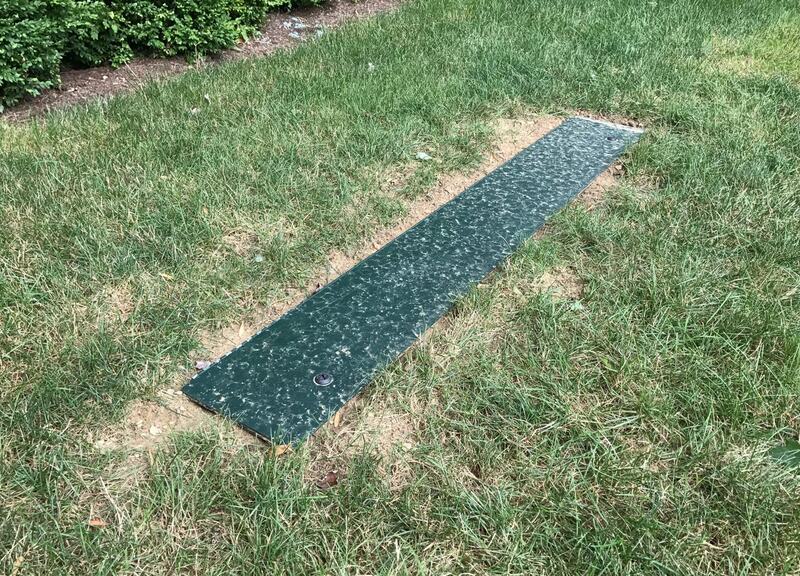 It developed holes straight off the most frequently used mats, and that was from shots occurring 10-15 yards away. The CrocBox net will be much closer, and thus ball speed will be higher and impact locations more consistent, so I was eager to see how well the CrocBox net would hold up. You’ll have to take my word for it, but I think the CrocBox net will hold up for a long time. 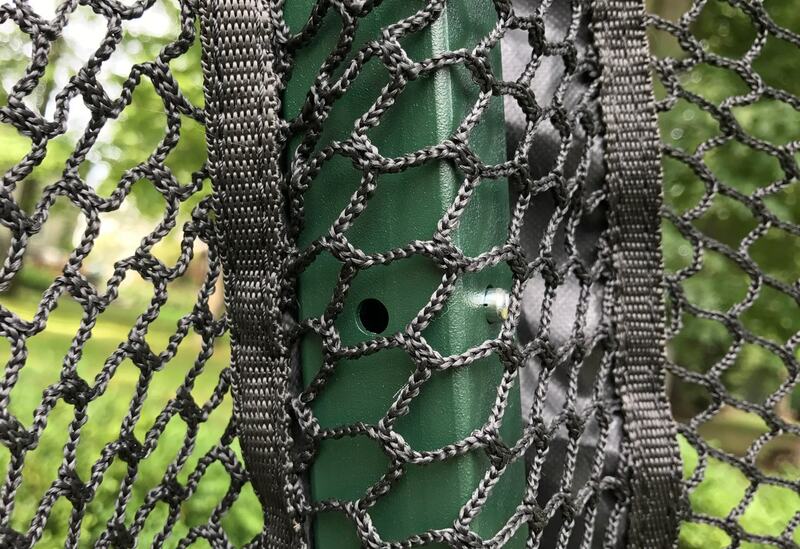 If you look at the closeup image of the netting and the pins above, you’ll see that unlike the netting we purchased for Golf Evolution, the netting is woven or braided together. The “golf netting” we purchased was tied or knotted together, and the knots would slide around every time a ball was hit, creating friction that eventually wore the net away and produced a hole. This netting will not suffer that same fate. There are no “moving parts” in this net. There is a one year warranty on everything. The net is a high test polypropylene. We have hit thousands and thousands of balls into a single net with zero issues. We even cracked two balls in half hitting them over and over. The net itself will last significantly longer than others because it is not exposed to the elements or most importantly, sunshine for extended periods of time. We keep a small mat and some golf balls inside our CrocBox. We take care, though, to make sure that neither prevent us from sealing the CrocBox fully. The second important thing in netting lasting a long time? The tension. The more a net can give – the less tight it is, whether by tying it down or just gravity pulling on and stretching the net – the longer the net will last as the ball impact is “softer” on a net that’s not taut. The CrocBox tension is great, here. 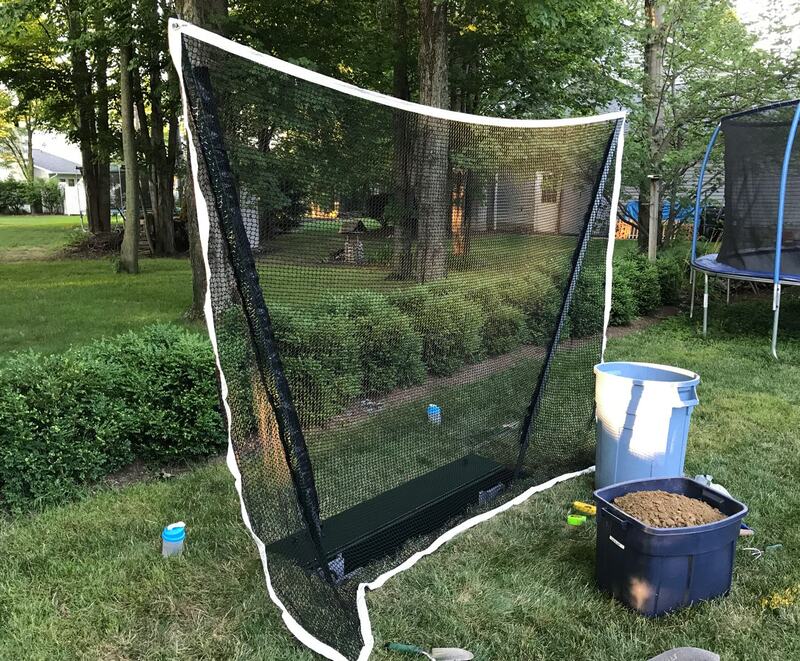 The CrocBox net is not stretched as tightly as I’ve seen on many other backyard practice nets, and the “puddled” net on the ground offers just the right amount of give and then spring to push the ball back to you. Too soft and the ball would fall down the back side or into the box. Too taut and the net would wear out prematurely. The CrocBox seems to get it just right. Unlike Christian, I can’t claim to have hit thousands of shots (yet) into my CrocBox, but I’ll update this review when I get to that point. Oh, and if after years of use, your net does wear out, replacement nets are available for $50. I’ve had the CrocBox for several months now, and we’ve enjoyed using it… for golf. Though I play recreational soccer, and played baseball as a youth, I have not tried kicking, throwing, or hitting other types of balls into it. The CrocBox is rated for and designed to accommodate many, many different sports. I’ve had the CrocBox for months, and it’s been warm, but after a particularly damp evening and a cool morning, I was surprised to open my CrocBox for a quick morning session to find two things: 1) a little bit of moisture along the top edge of the CrocBox, inside the rubber/foam seal, and 2) a little rust along the edges of the silver “guides.” The CrocBox had been sealed properly, and though rain had moved a little dirt around to just cover the outer lip, the seal had not been broken. You can see this here. I just spoke with the manufacturer and he said the cut edges of the guides may get a rust color, but it won’t affect the structural integrity of the CrocBox or the guides or anything else. Okay. That makes sense to me, though I’ll be sure to update this review should that ever change. If you are one of the many, many golfers who lack the time to get better at golf, but truly want to (and aren’t just making an excuse! <grin>), then the CrocBox is a great solution. I work with a lot of golfers, and while I try to prescribe drills that they can do inside, while brushing their teeth or watching television, there’s nothing like drills that involve swinging a club and hitting a ball. 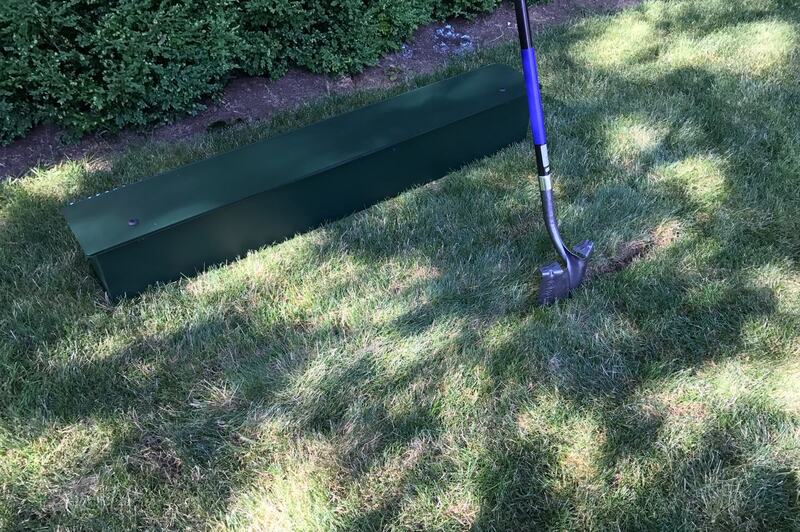 The CrocBox gives every golfer with a yard the opportunity to practice at a moment’s notice. It’s easy to install (once you get a mattock! ), a breeze to set up and take down, and works wonderfully. It won’t annoy the wife by being an eyesore in your backyard. 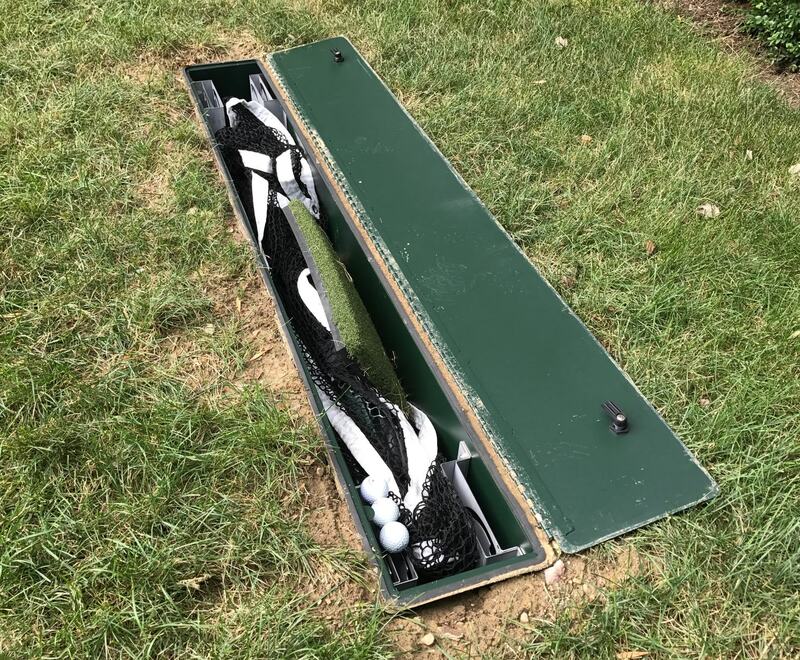 Whether you have five minutes or fifty to practice, at any moment, the CrocBox will let you get in your swings and improve your game. 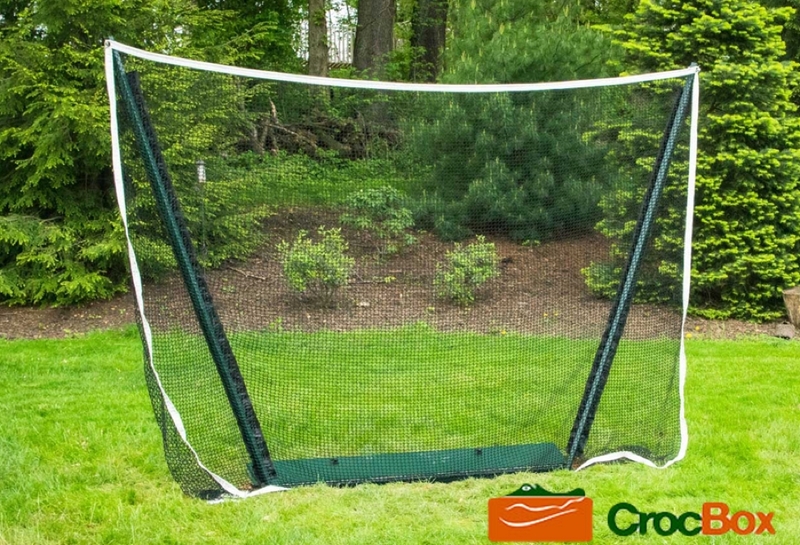 Yes, at $799 to $899, it’s at the upper range of home practice nets, but if you have kids involved in soccer, baseball, softball, or other sports, you may want to consider the multi-sport nature of the CrocBox. 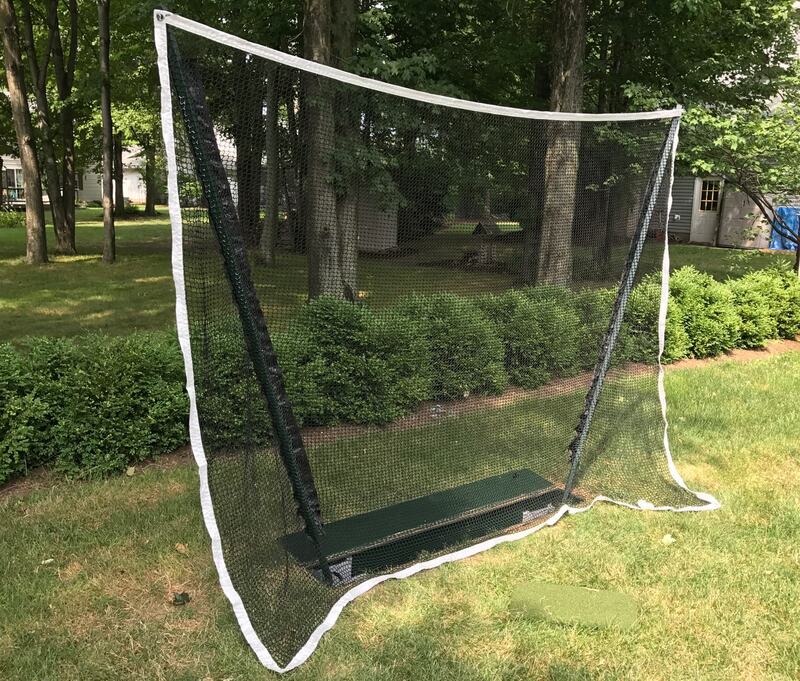 I don’t have a ton of experience testing out home practice nets – as I said, I live two and seven miles from some great facilities – but the CrocBox now falls into the “why didn’t I think of this earlier?” category. The CrocBox has changed the way – and the amount – that my daughter and I can practice. I recommend you check it out for your back yard today. Wow-This looks great for the serious golfer. Or soccer player or baseball or softball player. 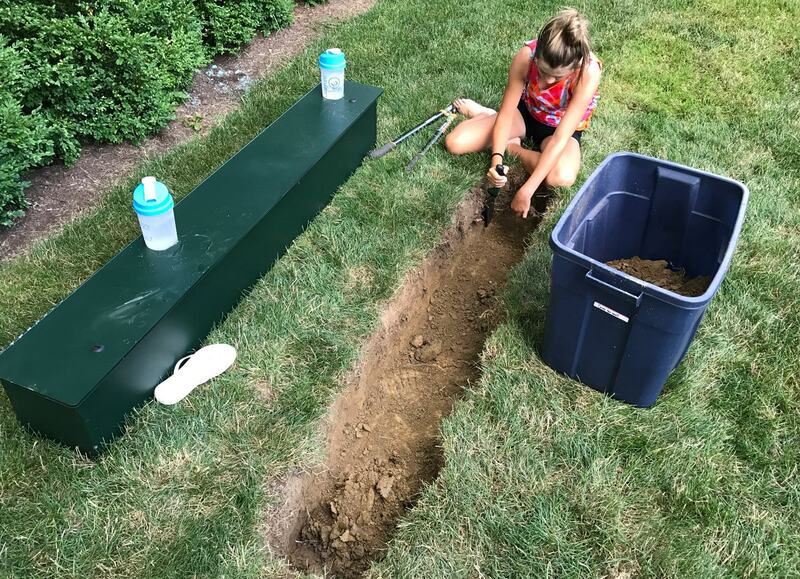 I am getting older and may start teaching from home sometimes and this may be just the ticket to avoid the wife nagging me about the net in the back yard.-Even though she uses it more than I do she hates how it looks.